I apologize in advance once again for taking advantage of my readers, but, you see, I have this weakness for dogs with (virtually) no legs. And don't get me started on those sad people who buy sundresses for their pugs or the retailers who prey on them by selling such abominations. 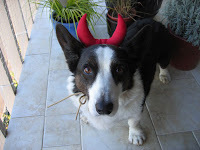 But by golly, can I resist a Corgi in devil horns all ready to go out trick-or-treating for biscuits on Halloween? Thanks, Loo, for the photo...and Tai for being so understanding. Aaaack!!! Too cute. C and I almost dressed up the dog and cat just to come trick or treat at your house. Would we have gotten wine as a treat? 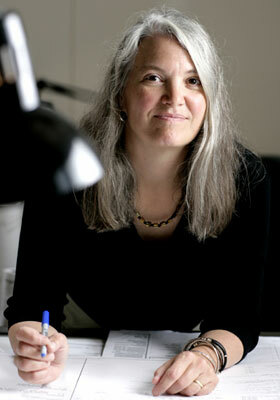 I'm glad that this photo is up on someone's blog! I keep trying to upload it, but it doesn't take. Sigh. Besides, you have WAY more readers than I do so that means way more people can soak up the cuteness! Oh, seh, you guys should have! We were hiding inside with the porch light out, watching a video. And, as you know, wine is always on hand! Can't figure out what the problem would be...the size and format are fine. And I realized I hadn't credited you or Tai, so that is now fixed. Thanks for sharing!